We pack up the truck tomorrow for the move to Chicago! So, this will be my last post from NY. Our internet will be disconnected tomorrow morning and we won’t get it back until Thursday…cause for a slight panic attack there. lol. I’ll be able to check e-mails and my etsy shop from the Mr’s iPhone, so that will help. 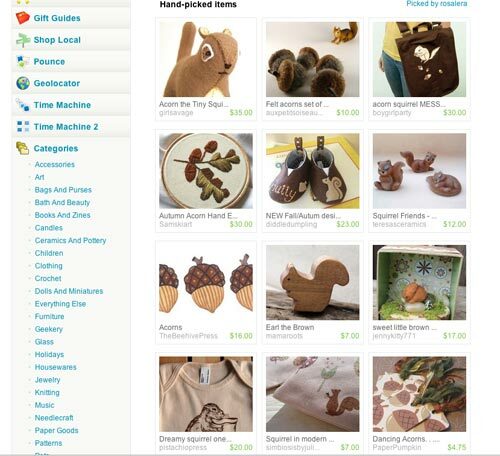 A nice little, Etsy style, going away gift today…Acorn the Tiny Squirrel Plush was on the front page of Etsy for a little while ! I will be back for a blog post at the end of the week, from Chicago!! Thanks for stopping by and have a great week! Congratulations on the front page & good luck with your move! Love that little squirrel. Good luck with the move. I wish I were moving to chicago! oo good luck on the move! hope all goes well and congrats on the FP!! !